You can get to the Facebook Settings on your Samsung Galaxy S 5 by tapping on the Menu button and tapping settings. Consider how much you want to control how many of these capabilities you want continuously. Even the most hard-core Facebook fan may need a break from all the notifications. Here are the options you have for settings. You can just go along with the defaults. Chat Availability: You can choose to chat or not when you’re running this app. Refresh Interval: You get to decide how often the Facebook app polls the Internet to see whether there are new posts. The default is every hour. Polling more often keeps you better informed, but it can drive up costs. If you choose Never, it looks for status updates only when you first open the app. Messenger Location Services: If you change your mind about having Facebook know where you are, here is how you would change the setting. Sync Photos: This option lets you share the images in your Gallery application with Facebook. This is a fun capability, but more than a few people have accidentally posted too many pictures from their phone to their Facebook page. Notifications: The next bunch of options can all be turned off if you deselect the Notification check box. If you want some but not all of these notifications, leave the Notification check box selected, and deselect the notifications you don’t want. The next selections offer you various ways you can be notified of a change occurring on your Facebook account. Vibrate: Every time something happens on Facebook, your phone vibrates. Phone LED: Every time something happens on Facebook, an LED lights up. Notification Ringtone: Every time something happens on Facebook, your phone makes a noise. Tap this line and you see all the options. These selections let you select which Facebook events trigger a notification alert. 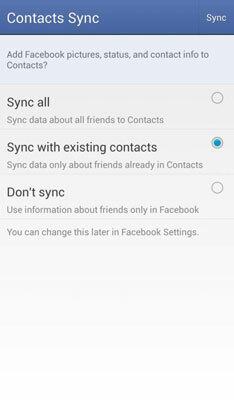 Sync Contacts: This option brings the screen to change your Sync status. There are lots of combinations and permutations for Facebook. Choose wisely.